Lee Jones earned the chance to sign for Edinburgh with a string of strong performances both for the Scotland 7s team in the IRB World Series and for his previous club Selkirk. Equally at home at scrum-half or on the wing, Jones has a number of impressive strings to his bow and has a bright future ahead of him. And following an impressive start to the 2011-12 season, Jones earned a call up to Andy Robinson's squad for the 2012 Six Nations. 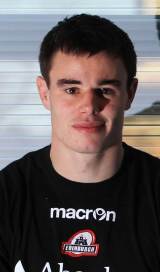 He played in four of Scotland' five matches in the tournament and scored his first try in national colours against France in February 2012. Jones looked set to be part of Scotland's party for their tour to the southern hemisphere in the summer of 2012 but injury put paid to that prospect as he was ruled out of contention.